Market makers have granted my wish. Lyft now has options and we can profit from the decline with minimal risk. Lyft, Inc. operates a peer-to-peer marketplace for on-demand ridesharing in the United States and Canada. It provides Ridesharing Marketplace, which facilitates lead generation, billing and settlement, support, and related activities to enable drivers to provide their transportation services to riders. The company also offers a network of shared bikes and scooters in various cities to address the needs of riders for shorter routes; Express Drive program, a flexible car rentals program which connects drivers who need access to a car with third-party rental car companies; and concierge for organizations to manage the transportation needs of their customers and employees. In addition, it integrates third-party public transit data into the Lyft app to offer various enterprise programs, including monthly ride credits for daily commutes, supplementing public transit by providing rides for the first and last leg of commute trips, late-night rides home, and shuttle replacement rides. The company was formerly known as Zimride, Inc. and changed its name to Lyft, Inc. in 2013. Lyft, Inc. was incorporated in 2007 and is headquartered in San Francisco, California. Company description from FinViz.com. Analysts are perplexed at the valuations for rid sharing companies. The drivers are free agents and the customer is a free agent. As one analyst said, "there is no stickiness in the business." Lyft managed to pump up its revenue over the last quarter because they were giving huge discounts to lure customers away from Uber ahead of the Lyft IPO. Offers like "50% off your next ten rides" were common. Lyft said it took market share from Uber in Q1 but they did not tell you it was because they were giving away highly discounted rides. This is going to be a cutthroat business. I know several drivers that drive for both Uber and Lyft and several have said they have picked up the same people on both services. It is whoever is closest and which ride will be the cheapest. With multiple competitors gearing up to enter the space the cost per ride is going to decline along with the payments to the drivers. This space is going to be a cat fight for the next couple of years while each of these companies tries to claw their way to profitability. With the Uber IPO now announced and Uber being a much larger and much more integrated company, they are going to be the assumed winner in the months ahead. Anyone investing in this space is going to want to be in Uber and not Lyft. You want to go with the winner and not the underdog that is losing money on every ride. In the Uber S1 they warned that they may never reach profitability. Lyft lost $900 million in 2019 and the cash burn is continuing. If Uber cannot be profitable with their multifaceted global business, how is Lyft going to be profitable offering only the cheapest rides available? 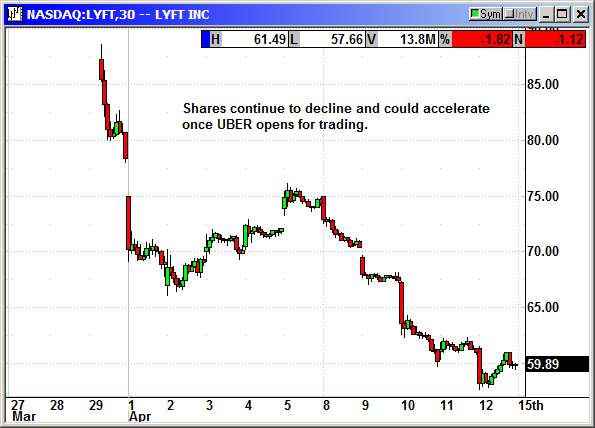 I believe Lyft shares are going to trade well under $50 in the coming months. I could be sorely mistaken but that is what I expect. When Uber begins trading, I expect Lyft to decline even further. Wide stops because of expected volatility. Buy June $55 put, currently $4.30, stop loss $76.25. Sell short June $45 put, currently $1.20, stop loss $76.25.